random thoughts...do or "di": Have you Discovered Modern Yardage? A few weeks ago I was contacted by Andrea, from Modern Yardage, asking if I would like to make something with their fabrics. Of course I jumped at the chance to sew with some new fabrics. I chose to work with these prints from the Garden Party line designed by Heather Dutton. The colors are so pretty and the fabric feels wonderful. The unique thing about ordering fabric from Modern Yardage is that all three yards came printed on one piece of 58" wide fabric. The printed fabric is still 44" wide, so the extra space on the fabric is filled with fun and creative value added items. Mine had a cute sun hat pattern on it. I decided to make another Travel Duffle Bag, but reduced the pattern by 25%. I have never reduced a pattern before and was surprized that my first try worked out. 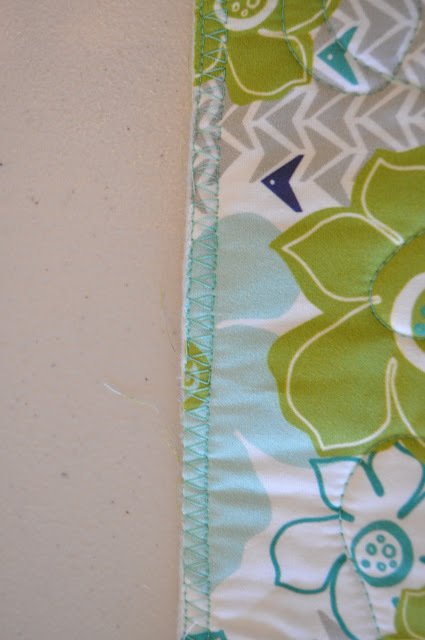 This time, instead of binding all the raw edges I used the #10 stitch on my Bernina. It is a nice zig zag overlock stitch. Since I do not have access to a serger, this worked really well. Next was preparing the outer pockets. This time I added end covers to all zippers. That really made sewing the final seams together so much easier. I did not break one needle! I used the grey Take Flight print for the handles and made them the way Lindsey taught us at Sew South. It is so much better than using the jute like the original pattern suggests. The walking foot was invaluable on this project because many seams are very thick and bulky. This photo really shows the exact colors so perfectly. 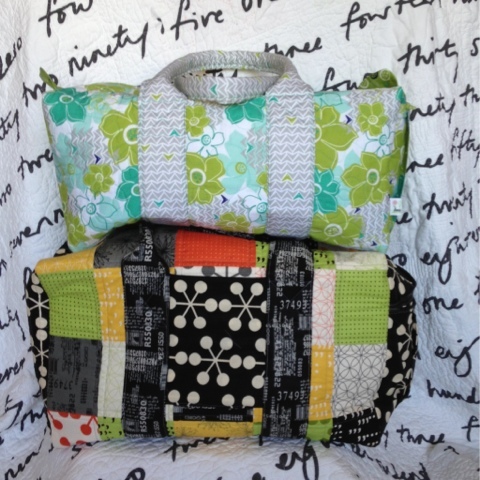 I love the way this bag came together and the Modern Yardage fabric is a perfect weight for this project. This shows the bag can stand alone using the Thermolam Plus, too. Here's an inside shot of the bag, which also shows the added elastic pocket that Lindsey taught at Sew South. I added my little tag on the side seam. 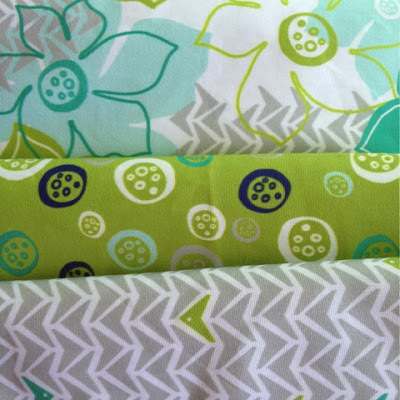 A really great selling fact about Modern Yardage fabric is they offer all their prints in three different sizes. Since they are not printed until you order them, you can order each print in whatever scale you want. I ordered the inside and outside fabric in the large scale and the handle fabric in the small scale. You can see the difference in the size of the bags here. It doesn't look like much, but the bottom one really is huge! This bag measures 20"x 8.5"x 8.5". It's a perfect size to take to the pool or beach, used as an overnight bag or a child's bag. 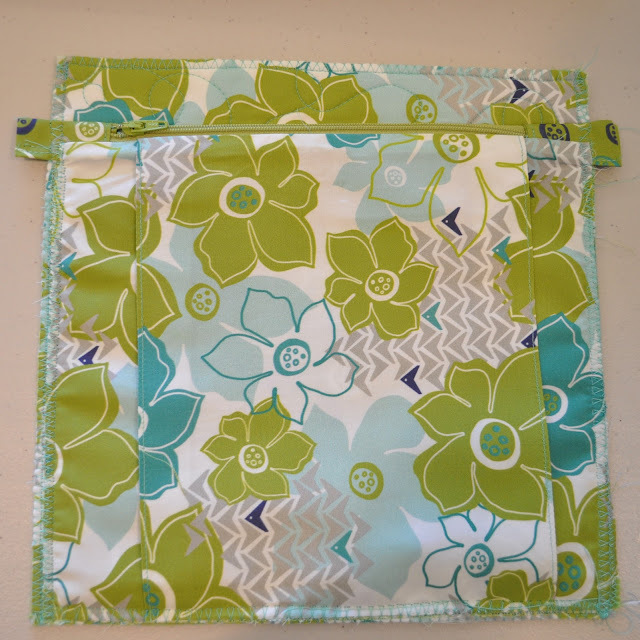 It was much easier to make this bag a second time and I love the Garden Party fabrics. Modern Yardage is a digitally printed fabric company. The fabric is printed on 100% cotton, pre-shrunk white poplin fabric. I also like that the water based inks used are environmentally friendly and no harsh acids or chemicals are used. And it's printed in the USA. 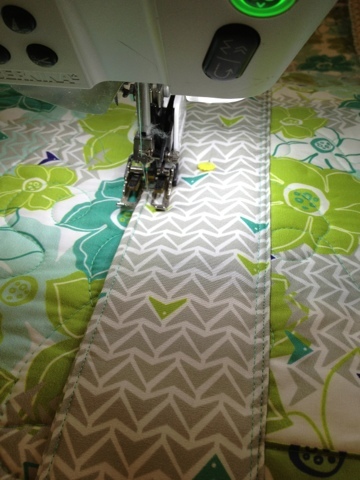 Give Modern Yardage a try. There are some really lovely fabrics available and I am deciding what to order for my next project. Great new bag, and lovely fabrics. 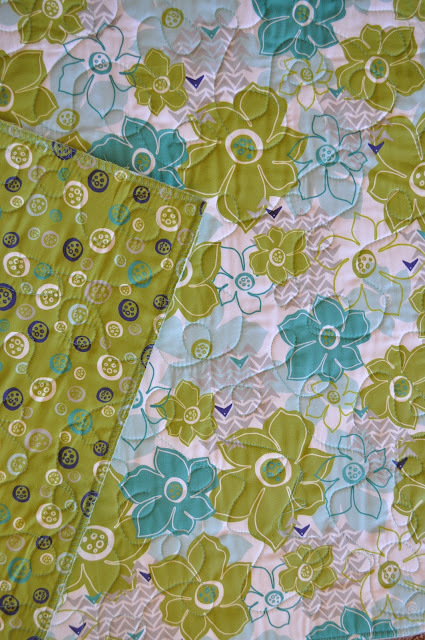 I read about Modern Yardage just last week and really like the idea of the wider fabric. Would love a photo of what the 'extra' bit looks like though. You have done an amazing job of this bag Di! This looks like wonderful fabric too! I must do some research on Modern Yardage. It's a gorgeous holdall Di, and like Susan I would love to see the sun hats. Beautiful bag(s)! I love how you showed each step...your pictures are excellent! Thanks for sharing...fabric choices are perfect for this! Lovely duffle Di. I'll have to try Modern Yardage. I have never heard of Modern Yardage. I will have to check it out. I love your bag!! What a cool concept! I'm just starting to hear about Modern Yardage and they sound awesome! Great bag! I would love to try making a duffle. Oh Di, you shouldn't have told me about this. I love everything I have seen so far! Gordon will be having words with you next month! Love the fresh look the fabric has. I am thinking about attempting that bag sometime in the near future. Di, your bag looks fantastic, and the fabrics are really beautiful. Do you mind a question? I'm making this same bag now (using the pdf version from her etsy shop) and I'm almost finished but I'm having trouble sewing the end panels in. I've finished the top and bottom of each end but am having a heck of a time figuring out how to pin and sew the sides of the end panels to the main bag. Any tips?? I have emailed the designer and am trying to be patient, but thought I'd ask you as well! It looks such a lovely summer trip bag; where could you be going!? Your bag turned out great! What a fun use of that fabric and I'm so impressed with your reduced size. I am going to try spray basting thermolam because I think it is a bear to get it to fuse well!